Are you a fan of a good bargain? I am, I love a good deal! Now, flip it around, when your client ask you for a discount, do you dread responding? For those thinking, “Oh, I hate when a client ask me for a discount” or “Dang it, now if I don’t offer a discount, I’ll lose the business,” this is for you. We have a society where discounts, savings, & special offers are the norm. People have been taught to ask for discounts. It’s not personal and it’s not a reflection on your product/service when someone asks you for a discount. How many times has a friend shared with you some great deal they got just by asking? He had every intention of buying the initial present regardless of being offered anything extra. He was only asking to see how many times she’d say, “Yes” before she told him “No.” It was a game to him. He walked away with seven presents for his wife, one he paid full price for and six he got for free because he asked. It’s important to know, just because someone asks for a discount, doesn’t mean you have to give one and more importantly, it doesn’t mean you’ll lose the sale if you don’t offer a discount. 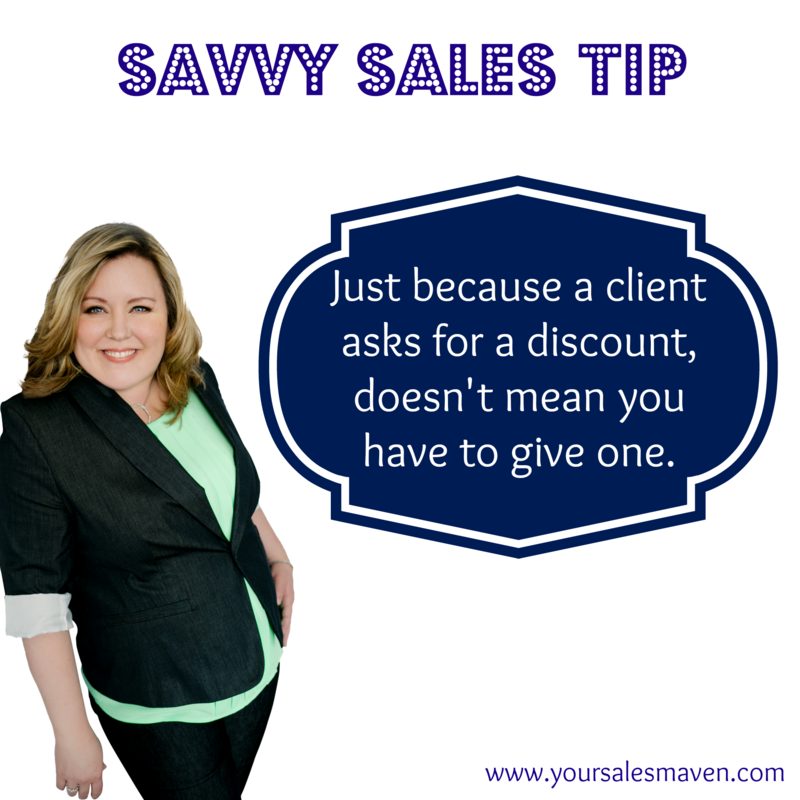 Of course, how you respond to them asking for a discount will play a huge role in the outcome. Here’s a suggested response as well as a real-life example to demonstrate how to use the Savvy Selling Tip. The reason for saying, “I appreciate you asking..,” is to acknowledge you’ve heard the request. The next part, “…here’s what I can do…” offers you the chance to layout options available to the client so they can make an informed decision on how to proceed. My client, *Lucy (who offers a service in an industry with tons of competition and varying price points), booked an appointment for a new customer. Before the customer came in for her scheduled appointment she sent an email to Lucy stating that she found someone else who provides a similar service at a much lower price. She wanted to know if Lucy would match the price. Lucy called me wanting to know how to respond. Even though Lucy was sure she’d lose the customer if she didn’t offer a discount, she agreed to give my strategy a try. We worked on specific language to phrase her response using the tip, “I appreciate you asking, here’s what I can do…” Lucy outlined her packages as well as the services her customer would receive during her appointment. The result, Lucy’s customer not only kept the appointment, she actually bought the most expensive package available. When you’ve done a good job of understanding your client’s needs and demonstrating how your product/service meets their needs, saying “no” to a discount rarely costs you the business. What have you experienced when a client asked you for a discount and you stayed firm on the pricing? *Out of respect for privacy, my client’s real name and the industry she’s in is not disclosed in this post. long time now and finally got the courage to go ahead and give you a shout out from Atascocita Texas! and will be tweeting this to my followers! Fantastic blog and superb style and design. Уour style is so unique compared to other folks I havе reаd stuff from. Hi it’s me, I am also visiting this website daily, this website is truly fastidious and the people are truly sharing fastidious thoughts. actually, you may also extend it to the “cost-centre” and “profit-centre” isesus. If the Sales team is able to bear the cost of hiring people to follow up the admin job, this is definitely the admin’s 份內事, if the Sales team is only able to support themselves (not enough to hire admin staff) and follow up the admin work by themselves, this is certainly Sales team’s 份內事;otherwise, will they dare to ask you (boss) to follow up the quote? I totally agree with your point that if the Sales did everything perfect; where came the value of the admin. staff? For the admin staff, if they ever grumble again, just tell them to pray for the Sales team continuing to make errors orelse you have to cut one of them. For the Sales team, as long as they are making expected profit as required and able to support the admin/secretary/ whatever…..who cares. Their existence is just to make money for you (boss) and cost-control is your duty. They are not to blame no matter how much errors they made. That’s the balance of income and expenses. 2 Sales, 1 Sales makes 1m a year and error free, no need for admin, salary is 0.5m, company get 0.5m. Another Sales make 2m, lots of errors, need admin, total salary costs 1m, but company can get 1m net…..then shall we blame the profitable Sales for making errors? No way, it’s just about profit and loss, who generate $$, who is the boss to direct the work and the workload….plus the definition of 份內事. So, you are the boss and you can define it.